In order to cater the needs of heavy data users, Reliance Jio has announced new prepaid recharge plans under 'Happy New Year 2018' offer. Jio has introduced two prepaid recharge plans priced at Rs 199 and Rs 299. Jio's Rs 199 prepaid plan gives users 1.2GB data while Rs 299 prepaid plan offers 2GB 4G data on daily basis. According to the official website of Jio (jio.com), the validity for the two prepaid recharge plans is 28 days. The new prepaid recharge plan comes bundled with unlimited free calls, unlimited roaming calls and free SMSes. Jio's Rs 199 prepaid recharge plan offers unlimited and free high speed data with a cap of 1.2GB 4G data per day. This prepaid recharge plan also gives free and unlimited voice calls which include local, STD as well as roaming calls across the country. The plan also gives access to free and unlimited SMSes, along with subscription to premium Jio Apps for all Jio Prime Members. The validity of this prepaid recharge plan is 28 days. The validity for the two new Jio prepaid recharge plans is 28 days. Jio's Rs 299 prepaid recharge plan offers unlimited and free high speed data of 56GBs for a period of 28 days. Under this offer, subscribers can use 2GB 4G data per day. This prepaid recharge plan comes bundled with free and unlimited local, STD and roaming calls. 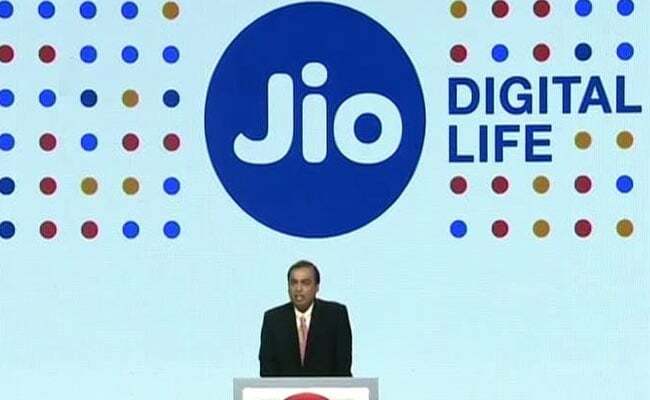 The plan also gives free and unlimited SMS benefits, said Jio website. 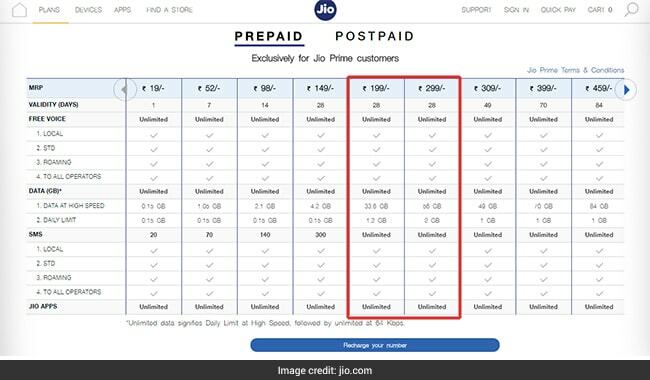 Rs 299 prepaid recharge plan also gives access to Premium Jio Apps for all Jio Prime Members.